Monster GreenPower Surge Protector MDP 900 provides you with an efficient solution for power saving and saving your money. This amazing equipment helps to guard your PC against spikes or constant fluctuation in AC power and develop an overall protection against potential damaging dips. The equipment also helps you in space saving management as you are connecting all your cables to the same equipment. The Monster GreenPower Surge Protector MDP 900 comes with special features that filter out the noise and electromagnetic interference thus helping you to maintain a steady performance of your computer. The GreenPower is another highlighting feature of the Surge Protector MDP 900, with this advanced feature you can save unnecessary power consumption and reduce energy waste to a considerable extent. With 10 colored coded outlets, you can easily connect the cables and its accessories. Out of the 10 outlets, the 4 of them feature the Monster GreenPower technology. The GreenPower outlet is switched off automatically when the computer is shut down and they are turned on when the computer is switched on. 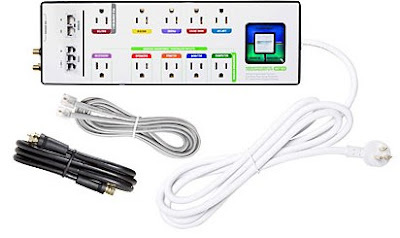 The Monster GreenPower Surge Protector MDP 900 has two sets of coax connections, which guards the computer against any kind of voltage spike coming through the TV line or the cable modem. This feature also provides an added protection for Ethernet connections and phone. You can also charge your Mp3 player or any other chargeable device via USB as the Monster GreenPower Surge Protector MDP 900 comes with built in two USB ports. 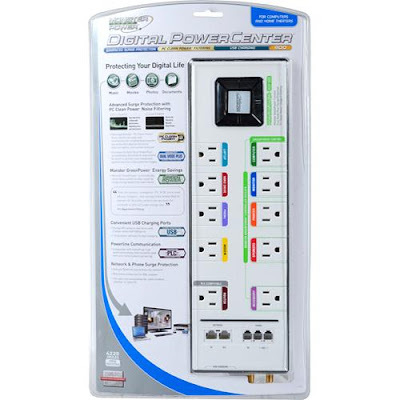 The Monster GreenPower Surge Protector MDP 900 is reasonably priced at $86.50 and comes with a five-year warranty that covers $300,000 insurance on any properly connected device.